Our self-published books: What Can I Do? 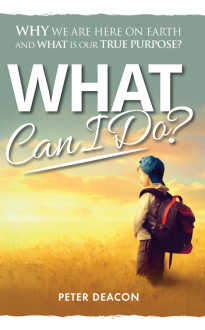 What Can I Do?…. Peter Deacon started asking the fundamental questions ‘Who am I?’ and ‘What Can I do?’ when he was a boy. Now he feels he has reached an understanding of the truth about why we are here on Earth and what our true purpose is, and has written two books to pass on this wisdom. The purpose of the first volume, Who Am I?, was to help you to discover who you really are by enabling you to view your life from a different point of view, and from that viewpoint to learn ways to deal with your problems in life so that you can create a better life for yourself and those around you. What Can I Do? takes matters further by explaining how you should develop your relationships with yourself and others and with your own Soul and inner being.